Art loves the idea of bringing people together through food. It’s partly what made him the success he is today. He is the executive chef and co-owner of Table fifty-two, Art and Soul, Southern Art and Bourbon Bar, and LYFE Kitchen restaurants. 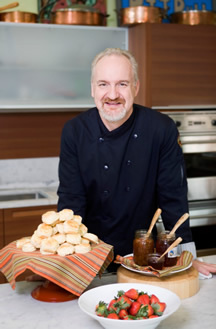 Art Smith has received the culinary profession's highest awards and has cooked for some of the world's most famous celebrities. In 1997, Smith became the personal, day-to-day chef to Oprah Winfrey, a position that lasted ten years. Smith now coordinates and cooks for special events all around the world. Most recently Smith has made several television appearances including ABC’s Lady Gaga Thanksgiving Special, Top Chef and returned to Top Chef Masters (for the second time), where he quickly became an audience favorite. Chef Art Smith was also featured in an episode of Extreme Makeover: Home Edition where he lend a hand to a deserving family that has devoted their lives to providing meals for the less fortunate members of their community. Smith has made regular television appearances on programs such as Iron Chef America, The Today Show, Good Morning America, Nightline, Fox News, Extra, Entertainment Tonight, BBQ Pitmasters, The Dr. Oz Show and The Oprah Winfrey Show. He has appeared on the cover of Parade magazine, and has been featured in Cooking Light magazine. He is a regular contributor to Standup magazine, whose proceeds benefit The Ben Cohen Standup Foundation, which raises awareness of the long-term, damaging effects of bullying. Smith is the author of three award-winning cookbooks: Back to the Table; Kitchen Life: Real Food for Real Families; and Back to the Family. He contributed recipes and cooking advice to The Spectrum, the newest book by ground-breaking cardiologist and New York Times bestselling author Dr. Dean Ornish. In May of 2013 his latest cookbook will be released, Art Smith’s Healthy Comfort, with a focus on healthy cooking and healthy living, (published by Harper One 2013). Smith is the founder of Common Threads, a non-profit organization teaching low-income children to cook wholesome and affordable meals since 2003. He believes that through hands-on cooking and introducing children to fresh foods we can help prevent childhood obesity, reverse the trend of poor eating habits, and learn about diversity and tolerance through the celebration of our cultural differences and our commonalities. Smith was honored by Chicago magazine as a Chicagoan of the Year in 2007. That same year, the prestigious James Beard Foundation named him Humanitarian of the Year. In 2008 Chef Art Smith received an Honorary MBA Degree, awarded by the Dedman School of Hospitality at Florida State University. Smith was inducted into the Chicago Culinary Museums Hall of Fame in 2010. September 30th 2010 was proclaimed by Richard M. Daley, Mayor of The City of Chicago as Chef Art Smith Day in Chicago. May 19, 2012 Chef Art Smith received an Honorary Doctorate of Culinary Arts from Johnson and Wales University, North Miami Campus.